This agistment agreement is a contract for one party (the agistor) to assume responsibility for the maintenance and welfare of another party's livestock in return for payment. Agistment may be arranged by a brief discussion. However, verbal agistment agreements rarely plan for problems such as veterinary care or disease, non-payment by owners, or the need to relocate animals in emergency. Nor is there any record of what was agreed if there is a dispute. 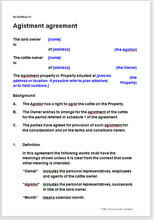 If a dispute does arise, the terms of a verbal agreement can be hard to prove.